Galactic very high energy gamma ray sources in the inner Galaxy tend to cluster within 1 degree in latitude around the Galactic plane (Fig. 1), with only three sources (HESS J1442-624/RCW 86, HESS J1356-645 and the recently discovered source HESS J1507-622 covered in this SOM) at latitude below -1.5 degr. and none above +1 degr. At a latitude of -3.5 degr., HESS J1507-622 is located at the very edge of the survey range and stands out. HESS J1507-622 (Fig. 2) is slightly extended, with an estimated intrinsic source size of 0.1 degr., hence most likely a galactic rather than extragalactic source. Its latitude implies that it is either rather close - within about 1 kpc, or is located well off the Galactic plane. The gamma ray flux is about 10% of the Crab Nebula's flux. 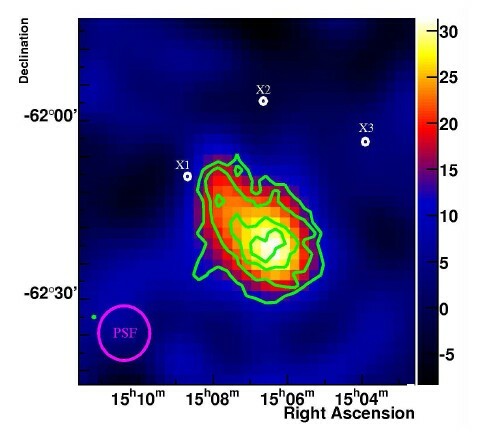 A search for counterparts in other wavelength regimes - X-rays (ROSAT), infrared (MSX) and radio (MOLONGLO) - failed to show obvious counterparts; of the three very faint ROSAT X-ray sources in the field, two are well outside the gamma-ray source, one (X1) at its edge (Fig. 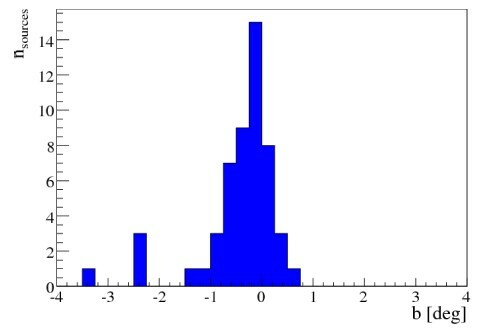 2), with a luminosity less than 10% of the gamma-ray luminosity. What could HESS J1507-622 be? One explanation is in terms of an old pulsar wind nebula, where magnetic fields have decayed and where radiative losses have cooled electrons to the extent that most of the synchrotron emission falls below the X-ray regime and cannot be detected. The modest extension of source - with 0.1 degr. smaller than other pulsar wind nebulae - would then argue for a multi-kpc distance and a location well below the plane. Another explanation might be in terms of a supernova remnant expanding into the uniform low-density medium away from the Galactic plane. This scenario faces the problem that a remnant of the size of the gamma ray source would have to be fairly young, and should be visible in X-rays (as is the supernova SN 1006, despite a much lower gamma-ray flux). Reference: O. Tibolla et al., "New Unidentified H.E.S.S. Galactic Sources", Proceedings of the 31st International Cosmic Ray Conference, Lodz, 2009, and arXiv:0906.0574. Fig. 2: Smoothed gamma-ray count map of HESS J1507-622. The green contours show 3, 4, 5 and 6 sigma significance. White circles indicate three faint ROSAT X-ray sources.